This has been a very crazy week for me! I do apologize for not posting daily.....I'll be back to doing that starting tomorrow!!!! I have some exciting news for you all! I was asked to be a Guest Designer for the month of May for Shirley's 2 Girls!!!! You'll see my first official DT post next Thursday for the Twisted Sketch challenge. Speaking of next Thursday, we'll be doing something a bit different! Instead of a twisted sketch, we'll be doing a blog hop with the entire team!!! You don't want to miss out any of the fun stuff so make sure you *check* in next Thursday!!!!!! Now, onto my card for today!! My post is for the Twisted Sketch and this week's twist was to add dimension----too easy!!!!! I also used the color challenge from SCS to use Real Red, Basic Black, Old Olive & Whisper White. I added a bit of texture to the old olive with my Big Shot, added dots around my scallops for a bit more interest & tied a bit of striped ribbon onto my white satin piece. I think that finished it! I need to work on my Etsy card for tomorrow. We have a fun shop to oogle at so come back for your chance to win a nice prize!!!! Thanks so much for stopping by and have a great rest of the day! Awesome Jackie! I'm so glad you will be joining the team as a guest designer! Congrats on the DT gig! You are perfect for it! jackie!! wowzee!!! this is EXXXXCITING news! and this card is lovely..black and red with that particular green is so striking... TFS!..and congrads! Jackie, this is just GORGEOUS! I so love that main image, and your interpretation fo the sketch was SPOT ON!! I'm so excited for you to be part of the team this month. Your inspiring work is sure to give us all a shot of creativity! Thanks for playing Twisted Thursday! This is great! It has some much going on that works. Lovely, really lovely. Your card is gorgeous--great colors! Congrats on being chosen for the DT! You did a great job combining the sketch and color challenge and not having the red and green combo look "Christmas-y". Hehe..I didn't know you blogged either. I will add you to my list. Congrats on your guest appearance. Your work is always super. Congrats...I am truly happy for you! You and your creativity deserve it! 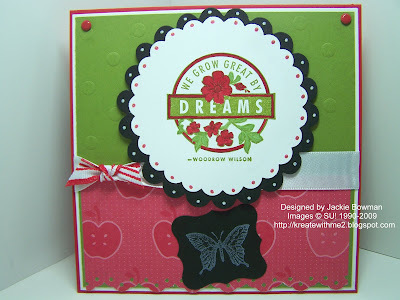 Gorgeous card...love that stamp set. Congrats on your Guest DT posting for May ... enjoy! Love your take on this weeks sketch - awesome colours! Congrats on your being selected for a guest designer. Great card. Really love your take on the sketch...hope you have a fabulous weekend!! I really like this card girl!!! I like that paper and the circles and the layout and embellies you used!!! Congrats on the Guest DT spot!!! Wooo Hooo!!!! Jackie this turned out great. Can't wait to see what you come up with for your guest designer projects. Looking forward to seeing them. Congratulations! Love how you colored the main image-there are those scallops again-will my punch ever get here!!!!! Big congrats on your guest DT spot! I know you will do a great job.